From speaking with colleagues and teaching postgraduate students about the process of scientific writing for more than ten years, I estimate that eight or nine of every ten biomedical researchers would say they don't like writing. Now, while I do like writing, that's not to say I find it easy. When I'm in the thick of getting my thoughts onto the page, terms such as "bloodbath" and "fight to the death" flood my mind. I have images of fighting a slippery dragon, trying to break its back. I feel as if I'm fighting my own ideas or whatever I'm trying to write, and there's only one possible outcome: breaking these ideas down, whatever the cost. And remember, I like writing, so imagine what it's like for the majority of scientists who don't. To illustrate what can go wrong with the writing process, I'm going to refer to an old fairy tale: Sleeping Beauty. This means readers are expected to hack their way through the word forest, if they're really committed to understanding the results. The only problem with this approach is that it doesn't consider the sheer number of papers that scientists need to read. Most researchers and academics can't keep up with their fields, so if a paper is hard to understand, or unclear, researchers may simply put it down and pick up the next one in the pile. In fact, a "sleeping beauty" is now a recognised type of academic paper. A sleeping beauty experiences what is also termed "delayed recognition", sleeping within the literature for up to 100 years until another paper known as the "prince" recognises its value. 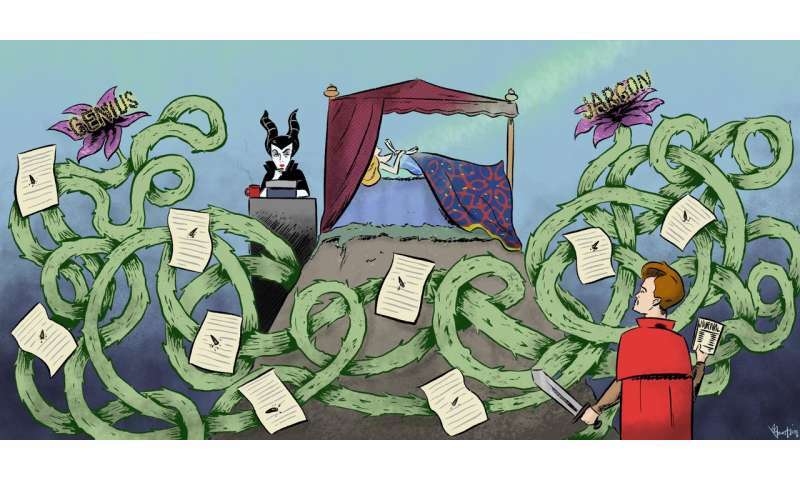 The sleeping beauty goes on to be highly cited and influential, sometimes in a different field. Researchers now study sleeping beauties and their princes, as a kind of extreme example of how science works – or doesn't, depending on your perspective. It's generally assumed that sleeping beauties describe ideas that were ahead of their time. But I wonder whether some of these papers might have also been asleep in their forests of words. After all, we only know about these scientific sleeping beauties through their awakening, in the same way that without the prince's determination, the story of Sleeping Beauty may never have been told. It is very difficult to know how many other ideas may be lying dormant in the literature, wrapped in their forests of words. It's important to remember that in the story of Sleeping Beauty, many people fell asleep in the castle. Also, scientific papers are not just about their authors, but also about the public funds and the many supporting resources that make them possible. We can't afford the risk that our results and ideas fall asleep. Humanity doesn't have the next 100 years to wait.